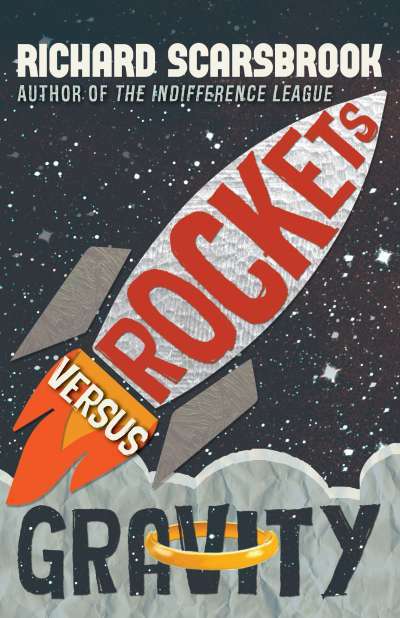 An abundance of characters navigate Rockets Verses Gravity, and the book is unusual in its writing style. With multiple stories going on their own trajectories, especially early on in the book, it’s hard to grasp where Richard Scarsbrook intends to take his reader. There’s a lumberjack who keeps losing his wedding ring, four times in fact. With a wife that keeps nagging him about everything, it probably is a metaphor for a marriage on the verge of collapsing. Then, there's a young girl Clementine who gets pregnant. Her character surfaces years later (or later on) in the book. James is a would-be rock star now selling insurance. He is unhappy to have given up his passion. His marriage to the boss's daughter is complicated. He is on the brink of also discovering he has a terminal illness and with all the unhappiness in his own marriage he finds himself fantasizing of another woman Priya. There are more intricately woven stories in Rockets Verses Gravity, which you can read for yourself. Like a wine waiting to open up, this is a book that you have to give time to put the pieces together and enjoy. Because there are a lot of seeming short stories packed in this book at the beginning, patience is key. I wanted them to start to connect earlier on, but realized that it would have been hard for Richard Scarsbook to do. After all, his characters each have a prominent presence in the book, without a single narrative voice dominating over the other. He needed the time to build these characters. Unique Toronto references add to the enjoyment of Rockets Verses Gravity. Being a foodie and restaurant lover myself (as is evident by the sukasastyle.com blog), I loved the point Richard Scarsbrook makes in the conversation between James and his wife Sidney, who is going to celebrate a sales achievement at Oliver & Bonachini's Canoe Restaurant with her boss. This is one of those restaurants that Richard Scarsbrook describes as a place "where nobody pays the bill with their own money. If you don't have a corporate expense account, or if you aren't deducting the cost to reduce your net income on your tax return, you probably aren't dining at Canoe." Quite a true analysis and also in terms of a foodie experience, highly overrated. O&B Canteen, Biff's Bistro and Jump, are great SukasaStyle recommendations though. In Rockets Verses Gravity, the narratives mirror real life in a way. Every action has a reaction. Just like in life, many of those actions lead to unintended consequences. It is a book that one must be patient with. This is one of those books that will divide readers. Some will absolutely love its scientific metaphor, while others will be longing for a meatier singular storyline. Read it for yourself and let us know in the comments below.